The IPG HVAC Acrylic Duct Tape 1.88-inch x 120 Yards - 2 Pack is designed for seaming, closing and repairing of flexible ducts. The superior flexibility allows for easy moulding to a variety of shapes. Our tape is temperature rated, flame retardant, has high shear adhesion and is UV resistant. 1 Box contains 2 rolls of 1.88-inch x 120 Yard tape. Aggressive, long-lasting acrylic pressure-sensitive adhesive. Duck MAX Strength Packing Tape offers premium quality for all of your heavy-duty shipping, moving and storage needs. Stronger and more durable than ordinary tapes, this packaging tape is designed to seal even the heaviest boxes safely and securely to help prevent items inside from being damaged during delivery. This clear packing tape offers superior quality whether you're on the move or shipping boxes from the home or office. And, it's tough adhesion makes it perfect for protecting and storing your belongings all year round. Duck<sup></sup> Brand Standard Packaging Tape is an easy and affordable solution for all your lightweight shipping, moving and storage needs. This packaging tape is designed to seal boxes safely and securely to help prevent items inside from being damaged during delivery. Choose the clear tape for discreet packaging or storing. Plus, it comes in a variety of colours so you can help simplify your move without breaking the bank by colour-coding your boxes. 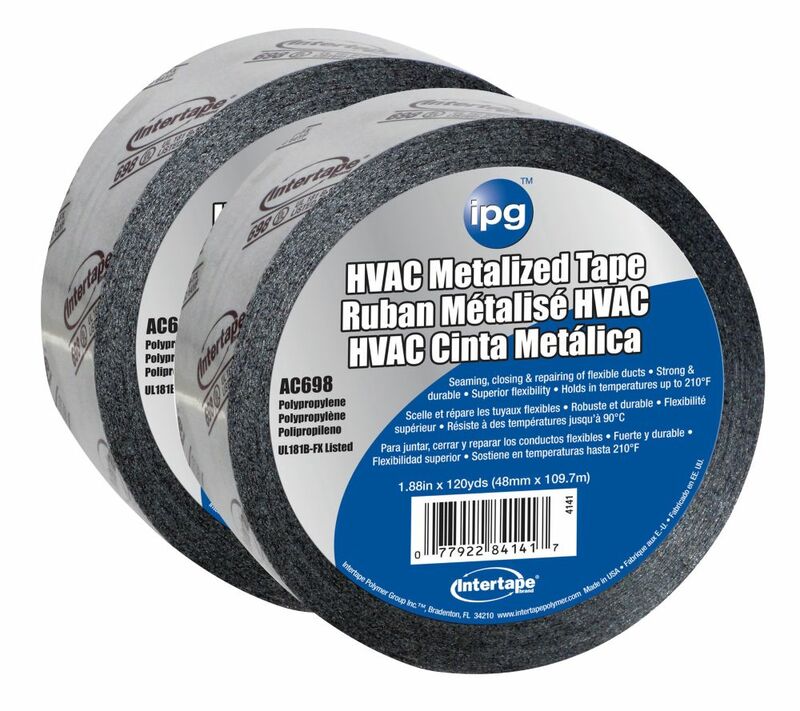 The IPG HVAC 1.75 MIL Aluminum Foil Tape 2-inch x 50 Yards - 4 Pack is designed for Cold Weather HVAC duct seaming, patching and sealing to enhance appearance and maintain vapour barrier integrity. This item is engineered for superior bonding when exposed to either sub-zero or elevated temperatures. Our tape is flame retardant, has high shear adhesion, is UV resistant and has excellent reflective properties. 1 Box contains 4 rolls of 2-inch x 50 Yard tape. Intertape Polymer Group HVAC Acrylic Duct Tape 1.88-inch x 120 Yards - 2 Pack The IPG HVAC Acrylic Duct Tape 1.88-inch x 120 Yards - 2 Pack is designed for seaming, closing and repairing of flexible ducts. The superior flexibility allows for easy moulding to a variety of shapes. Our tape is temperature rated, flame retardant, has high shear adhesion and is UV resistant. 1 Box contains 2 rolls of 1.88-inch x 120 Yard tape.